The visionary St. Faustina (Maria Faustina Kowalska) was a unique and simple soul that communed with our Lord much of her life, joining a religious order in 1925. In 1931, our Lord appeared to her in a vision in a white robe, his hand raised in blessing with two large rays emitting from his side; one was red and the other pale. He asked her to paint an image of the vision, just as she saw it and accompany with it the signature, “Jesus, I Trust in You.” “I am offering people a vessel with which they are to keep coming for graces to the fountain of mercy. That vessel is this image…” (Diary 47-48). Later, the Lord explained to her that the two rays were blood and water. The pale, which is water that makes souls righteous and the red, blood which is the life of souls. Christ instructed, “These two rays issued forth from the depths of My tender mercy when My agonized Heart was opened by a lance on the Cross, “(Diary 299) and would, through this image, bring much grace to many souls. Eventually, she employs the services of a Polish artist (E. Kazimirowski) to paint the image which he completes in 1934. Faustina cries that the image of Christ’s face is not as beautiful as she saw it. Many versions of the image have been done since that time. This is my attempt. I pray many souls seek and find mercy through this image. I pray also for all artists trying to paint truth through their calling. May this be of assistance, as God sought an artist to bring a reminder of mercy to His people. May you be that artist. The feast day is Divine Mercy Sunday. From the diary of a young Polish nun, a special devotion began spreading throughout the world in the 1930s. The message is nothing new, but is a reminder of what the Church has always taught through scripture and tradition: that God is merciful and forgiving and that we, too, must show mercy and forgiveness. But in the Divine Mercy devotion, the message takes on a powerful new focus, calling people to a deeper understanding that God’s love is unlimited and available to everyone — especially the greatest sinners. The message and devotion to Jesus as The Divine Mercy is based on the writings of Saint Faustina Kowalska, an uneducated Polish nun who, in obedience to her spiritual director, wrote a diary of about 600 pages recording the revelations she received about God’s mercy. Even before her death in 1938, the devotion to The Divine Mercy had begun to spread. The message of mercy is that God loves us — all of us —no matter how great our sins. He wants us to recognize that His mercy is greater than our sins, so that we will call upon Him with trust, receive His mercy, and let it flow through us to others. Thus, all will come to share His joy. It is a message we can call to mind simply by remembering ABC. asking Him to pour His mercy out upon us and upon the whole world. extend love and forgiveness to others just as He does to us. C — Completely trust in Jesus. God wants us to know that the graces of His mercy are dependent upon our trust. The more we trust in Jesus, the more we will receive. Devotion to The Divine Mercy involves a total commitment to God as Mercy. It is a decision to trust completely in Him, to accept His mercy with thanksgiving, and to be merciful as He is merciful. The devotional practices proposed in the diary of Saint Faustina are completely in accordance with the teachings of the Church and are firmly rooted in the Gospel message of our Merciful Savior. Properly understood and implemented, they will help us grow as genuine followers of Christ. 2. Blessed are the merciful, for they shall obtain mercy" (Mt 5:7). It's an ironic and somewhat frightening fact that many of the most religious people of Christ's time (people who were actively practicing their religion and eagerly awaiting the promised Messiah) were not able to recognize Him when He came. The Pharisees, to whom Christ was speaking in the first quotation above, were very devoted to the prayers, rules, and rituals of their religion; but over the years, these outer observances had become so important in themselves that their real meaning had been lost. The Pharisees performed all the prescribed sacrifices, said all the right prayers, fasted regularly, and talked a lot of about God, but none of it had touched their hearts. As a result, they had no relationship with God, they were not living the way He wanted them to live, and they were not prepared for the coming of Jesus. When we look at the image of the Merciful Savior, or pause for prayer at three o'clock, or pray the Chaplet — are these things drawing us closer to the real sacramental life of the Church and allowing Jesus to transform our hearts? Or have they just become religious habits? In our daily lives are we growing more and more as people of mercy? Or are we just giving "lip service" to God's mercy? The devotional practices revealed through Saint Faustina were given to us as "vessels of mercy" through which God's love can be poured out upon the world, but they are not sufficient unto themselves. 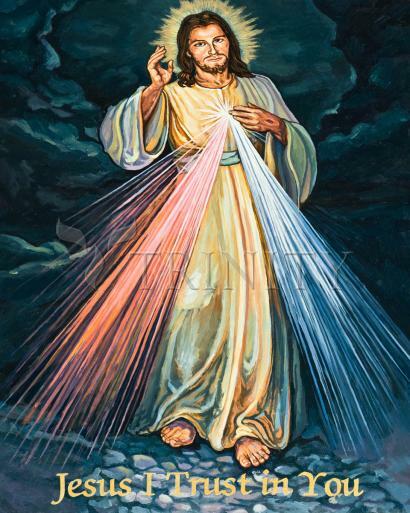 It's not enough for us to hang The Divine Mercy image in our homes, pray the Chaplet every day at three o'clock, and receive Holy Communion on the first Sunday after Easter. We also have to show mercy to our neighbors. Putting mercy into action is not an option of the Divine Mercy Devotion; it's a requirement! I demand from you deeds of mercy which are to arise out of love for me. You are to show mercy to your neighbors always and everywhere. You must not shrink from this or try to excuse yourself from it (Diary, 742). Like the gospel command, "Be merciful, just as your Father is merciful," this demand that we show mercy to our neighbors "always and everywhere" seems impossible to fulfill. But the Lord assures us that it is possible. "When a soul approaches Me with trust," He explains, "I fill it with such an abundance of graces that it cannot contain them within itself, but radiates them to other souls" (Diary, 1074). How do we "radiate" God's mercy to others? By our actions, our words, and our prayers. "In these three degrees," he tells Sister Faustina, "is contained the fullness of mercy" (Diary 742). We have all been called to this threefold practice of mercy, but we are not all called in the same way. We need to ask the Lord, who understands our individual personalities and situation, to help us recognize the various ways we can each show His mercy in our daily lives. By asking for the Lord's mercy, trusting in His mercy, and sincerely trying to live His mercy in our lives, we can assure that we will never hear Him say of us, "Their hearts are far from Me," but rather that wonderful promise, "Blessed are the merciful, for they shall obtain mercy."